TO MY SCREENIE PAGE !! ENJOY!! Welcome, guest. This is my screenie page. 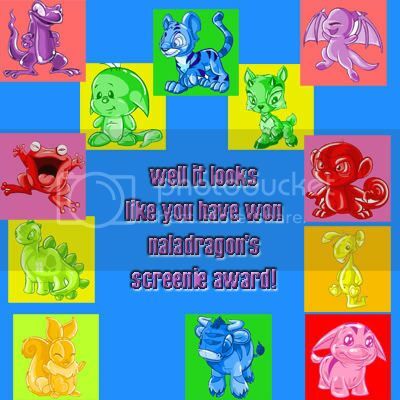 Every moment in Neopets which I want to cherish is here. I am planning to catogarize the screenies soon, so that you can view them easily. I am not very good in HTML. Awards are really appreciated!! Thank you to all the people who have awarded me!! Please visit my page often because I update it frequently! NOTE: When you first visit this page, yu can see nothing, because the images are loading. So please have patience while they load. P.S. Please link my Screenie Page back. Scroll to the bottom of the page for Link Back Buttons. IMPORTANT: If the images don't show up, right-click on them and click on Show Picture. WARNING: Do not STEAL my screenies!! I will report you to TNT!! If you liked my screenies, please link them back. Just copy and paste the code in your lookup, petpage or shop. IF YOU HAVE ANY PROBLEM WITH SCREENIES, THEN CLICK ON ANY LINK BELOW, AND THEY WILL HELP YOU ! !